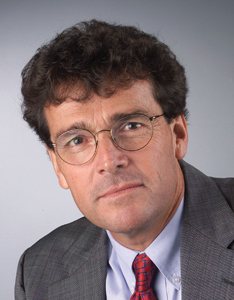 Thomas Fiedler began his tenure as Dean of the College of Communication, Boston University on June 1, 2008, following a distinguished career in journalism. After graduating from the U.S. Merchant Marine Academy with a bachelor’s in engineering, he earned a master’s in journalism at COM. Later, he joined the Miami Herald, where he would work for more than 30 years, as an investigative reporter, a political columnist, the editorial page editor, and finally, the executive editor, from 2001 to 2007. In 1987, after presidential hopeful Gary Hart told journalists asking about marital infidelity to follow him around, Fiedler and other Herald reporters took him up on the challenge and exposed Hart’s campaign-killing affair with a Miami model. The next year, Fiedler received the Society of Professional Journalists’ top award for his coverage of the 1988 presidential election. Three years later, his investigative work was part of a Herald series on a religious cult, which earned the paper a Pulitzer Prize. The Herald’s entire staff won another Pulitzer in 1993 for the paper’s coverage of Hurricane Andrew.